Soak the sticky rice in hot water for 1 hour. Steam the sticky rice in a Thai steamer for 10-15 minutes or rice cooker machine until cooked. Leave the sticky rice to cool, if it is still too firm, soak for an extra 5 minutes in water. Blend the galangal, lemon grass, garlic, chillies, coriander root, kaffir leaves together. Pipe into a sausage casing. Keep in fridge for a few day for make it sour. Bring to boil or steam for 30 minutes. Use folk or another equipment sharp pointed piercing device around sausage. Bring to be fried or grill until color turn golden brown and place on serving plate. Serve with fresh vegetable, slice ginger and bird’s eye chilies…hou..yum..yum.. This Thai pork sausage Isan style. Thais call “Sai grok I-san” and it’s a Thai-Isan snack. 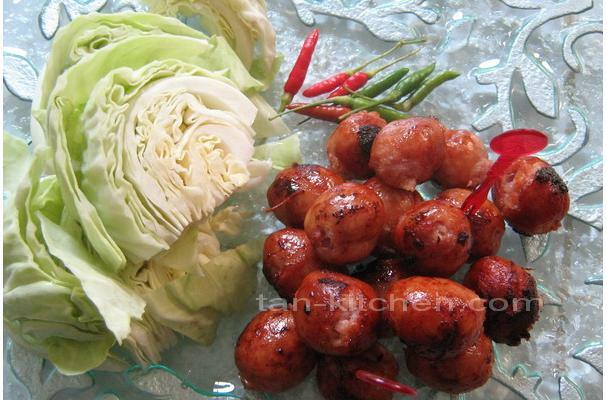 This Thai sausages use sticky rice as the filler/binder to extend the meat. Before bring the sticky rice to make sausage. We require soft rice and to get a softer consistency you can soak the pre-steamed rice in water for 1 hour at least or over the night before using. It’s messy job?? For me yessss..